Recently, I’ve been toying with an idea for a creative nonfiction piece that I want to enter in an upcoming writing contest, but I’m having a difficult time getting all the threads down. 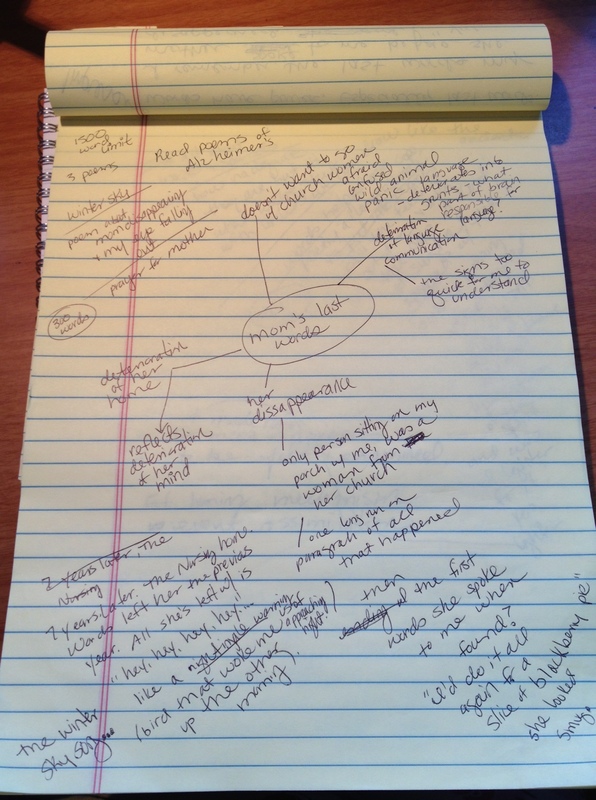 After reading about different plot tools in author Holly Lisle’s “Create a Plot Clinic,” I decided to try her idea of clustering to expand on my idea. Lisle says, “To cluster, you write a word, a phrase, or a question, draw a circle around it, draw an arrow, write the first word, phrase or question that comes to your mind in relation to the first circle, and keep writing and drawing until you’ve formed a web.” This technique is also called mind mapping, and I’ve used it before but then sort of forgot about it. So I pulled out my yellow pad and pen (colored pencils and drawing paper are fun, too) and wrote my original idea in the center of my paper and circled it. From there, I drew lines and other circles and wrote down the first words that came to me. Within a half hour, I had my entire piece outlined in the mind map. Mind mapping or clustering is a great tool for any project, whether it’s writing, cooking, or a business project. ← Do you write in a lab or a factory? Could you post a pic of your clustering on paper? Thanks – I’ve had some of my students post theirs and it’s interesting to see how different people approach this idea-generating method. I agree — do you have a link to share? Look at Gabriele Rico’s book “Writing The Natural Way” It is the chief source for all this.